I love that big earrings are in. I do. When I was growing up my mom had the best drawer of custom earrings. She had amazing hoops, chandeliers, dangly ones, really, every kind imaginable. Some made out of wood, or Bakelite, or metals. I loved being in the closet with her while she was getting ready for a night out because it meant looking through her drawers. Then, when I was old enough to realize I wanted to wear those earrings I learn that she has given them all away because, really after the 80s who wanted big earrings? She did save a few that I currently own. Nothing expensive but definitely BIG in the WAO factor. 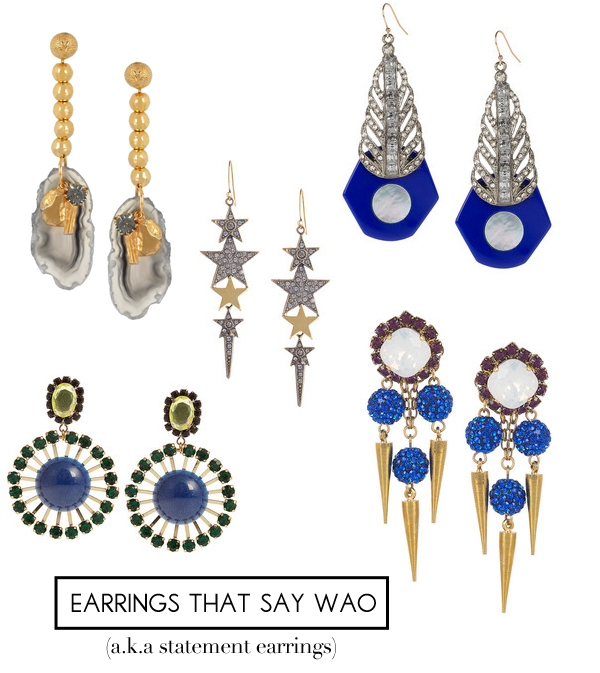 So, I'm very glad to see large earring beauties galore lately. Earrings can make an outfit for sure. Here is a round-up I hope you enjoy. Also, I'm guest posting over at Jennifer's The Pink Pagoda for her 31 days of Pink in October series. I gathered the cutest of the cutest pink or pinkish accessories from the newly opened Zara Home to host my ideal Pinktastic Tea party. Take a look. These earrings are definitely pretty, such pretty and vibrant colors! they are beautiful! Some of those are so deco looking- very cool. I bet you would look amazing with any of these! I never get to dress up fancy like, but I am guessing these would be very cool with a boho kind of vibe as well? Off to check out your pink party! The ones you chose are more fancy, they would be perfect with a beautiful party or evening dress! I adore big earrings, but can't wear earrings at all anymore. Within 5 minutes of wearing I have a huge reaction no matter the metal content. I still like to look at them though and these are amazing! Thank you so much for being my guest today, Albertina!